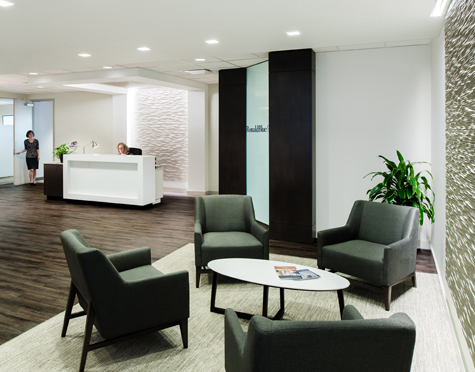 RJTR provided interior design services for Ronald Blue & Company's office renovation. 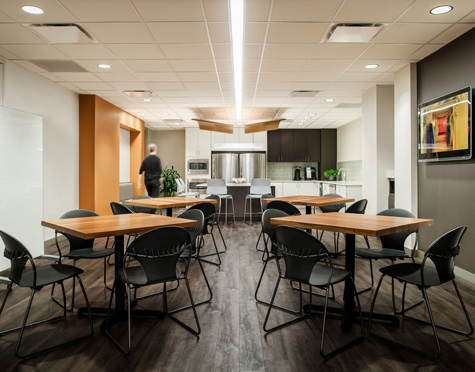 Ronald Blue & Company approached RJTR to unite their staff in a new 12,500 gross square foot open and collaborative workspace. To unify the two independent businesses within the company, the office was divided and designed to facilitate the needs of each group separately but were brought together at a celebrated shared edge. The breakroom and large conference room physically divide the two sides of the company, but pro-grammatically unite them. Within this space, the dividing edge is inscribed with light and ignited with shifting and overlapping materials, forms, and colors, celebrating the unique balance within the company. This activated edge spills into the reception area, where additional edges are defined but blurred. Conference rooms of differing types cultivate the unique needs of the company, balancing effective, yet welcoming, space to entertain clients.